Celebrating America’s birthday means there will be a lot of red, white and blue. In addition to dressing in patriotic colors and celebrating with patriotic decorations, it’s easy to prepare some patriotic foods for the holiday. 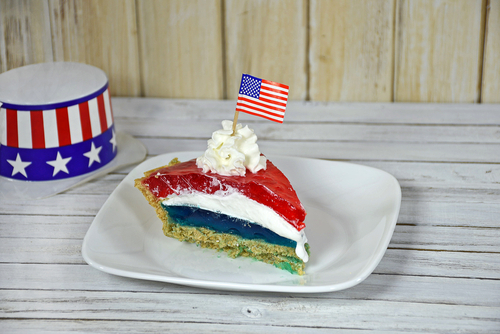 This simple Jell-O red, white and blue pie takes just 35 minutes to prepare and two hours to cool in the refrigerator, so you can spend more time out enjoying the festivities with your friends and family. Add 3/4 cup of boiling water to the blue gelatin mix. Stir the mixture for roughly two minutes or until the gelatin mix is completely dissolved. Add 1/2 cup of ice cubes to the combination and stir until the cubes have melted. Pour the blue gelatin mixture into the pie crust and refrigerate until the Jell-O is set but not firm (5 to 10 minutes). Repeat the same process with the red gelatin mix, combining it with boiling water and stirring until dissolved. Stir in the remaining 1/2 cup of ice cubes and let the red gelatin mix cool for 5 to 10 minutes. Smoothly spread your Cool Whip over the layer of blue gelatin, then cover it with the layer of red gelatin. Refrigerate the Jell-O pie for about 2 hours or until it is firm. Top the pie with fresh, seasonal berries from a local farmer’s market before serving. Nothing says freedom like traveling in a recreational vehicle. Celebrate this Fourth of July with a new or used RV from Fretz RV in Souderton, Pa. And if you’re already in the RV of your dreams, stop and see us for all of your summer RV accessories and camping supplies.